Do you have a room that is in need of a little pizzazz? But, are you on a tight budget? Creating an “accent wall” — that is, painting one wall a totally different color, or decorating it in another bold way — can help give your room a focal point… can create a lasting first impression and, well…because you’re only going to be fussing with one wall, can deliver champagne taste on beer budget. But where do you start? 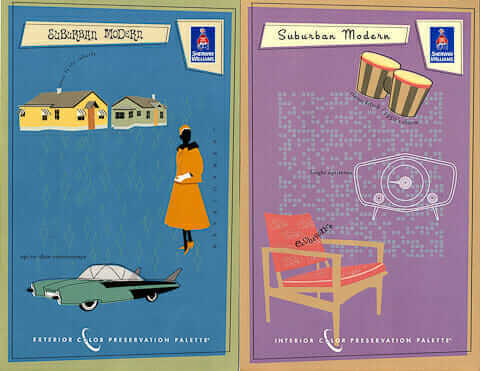 How do you choose which wall or which color will work best for your space and decorating taste? I have painted many an accent wall in my day, both in my house (where I have two rooms with accent walls) and in the houses of friends and relatives, who needed a little advice on which color to choose and which wall to accent. 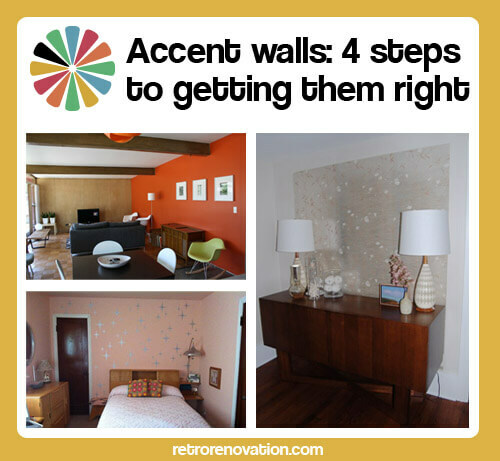 Based on my experience, I have four tips to get you started on your way to accent wall acclaim. 1. First, pick a room, then pick a wall. Choosing “which” room and “which” wall sounds easy, but there are a few things to consider before you resort to blindfolding yourself, spinning around in circles and throwing paint darts. The first order of business is deciding which room you want to tackle. A bedroom is a good place to start especially if you are going for a look that pushes the limits of your comfort zone. Bedrooms usually aren’t the largest rooms in the house, which means less paint and time are needed. Also if you get a bit too crazy with your accent wall, all you have to do is shut the door…your guests will never know! When accenting a wall in a bedroom, I like to choose the headboard wall, after all this is a bed-room, so shouldn’t the bed be the focal point? You can also choose the wall opposite the entry door, so it is the first thing you see when you peek in from the hall. 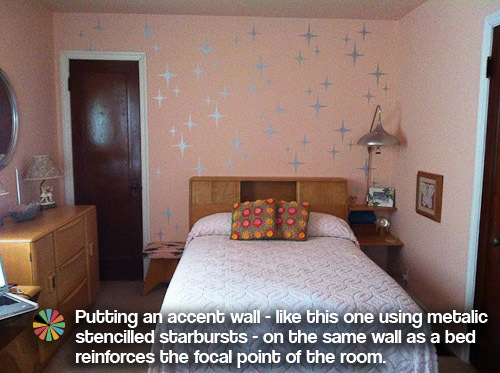 Above – Patti used metallic paint and a stencil to create a patterned accent wall in her bedroom. If you choose to put your accent wall in one of the more public areas of the house, such as a living room or kitchen, choosing a good wall to accent can be a bit more difficult. Look around the room you would like to liven up. What is the current focal point? 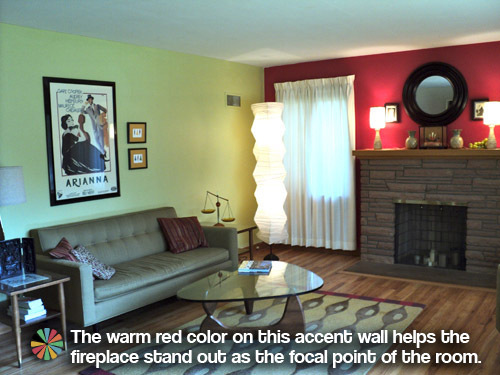 Is it the fireplace that could stand to be highlighted further by some clever use of color? Or maybe you have some interesting angled ceilings that you would like to play up with a touch of color. Perhaps your room is lacking a focal point. Try adding an accent wall behind your retro hutch in the dining room or painting the wall behind your midcentury sofa in the living room to highlight your great taste in furniture. Above – Rob and Julie’s used a bright red paint to further accent their cool stone fireplace in their Colorado living room. via 306 photos of reader living rooms. 2. Decide what accent material to use. 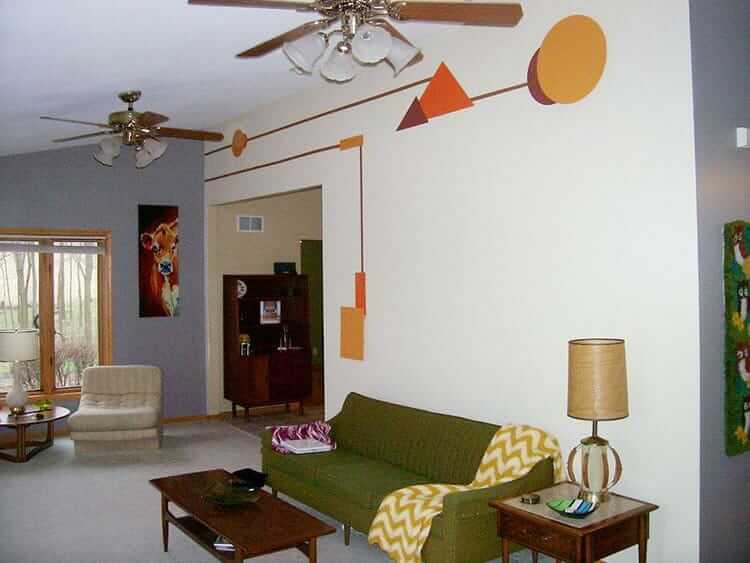 Painting a flat color on one wall isn’t your only option to create a fabulous new accent wall. If you are more of a minimalist at heart, then one color could be just the thing you are looking for, but keep in mind that many different effects can be accomplished with paint. Try painting your wall one color and then stenciling a shape or design in another color or sheen on top of it, depending on how adventurous you are feeling. 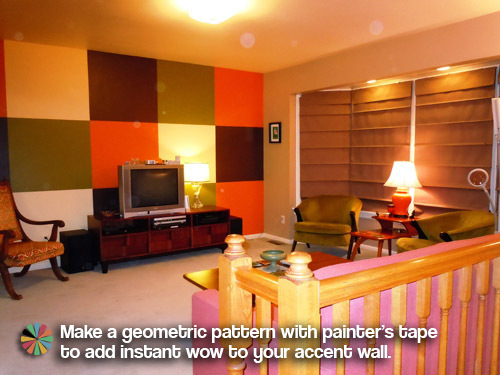 You could also draw out a geometric pattern, mask it off with painter’s tape, and create a bold, patterned accent wall. I’ve even seen some very ambitious people do giant paint by number style wall murals on their accent walls! Your only limitation is your imagination and the time you are willing to put into painting your wall. Above – Jason (BlueJay) and Nicky used several colors of varying intensity to create a geometric grid design on their accent wall in their 70s inspired living room…can you say “POW!” via 306 photos of reader living rooms. You can also create an accent wall using wallpaper. 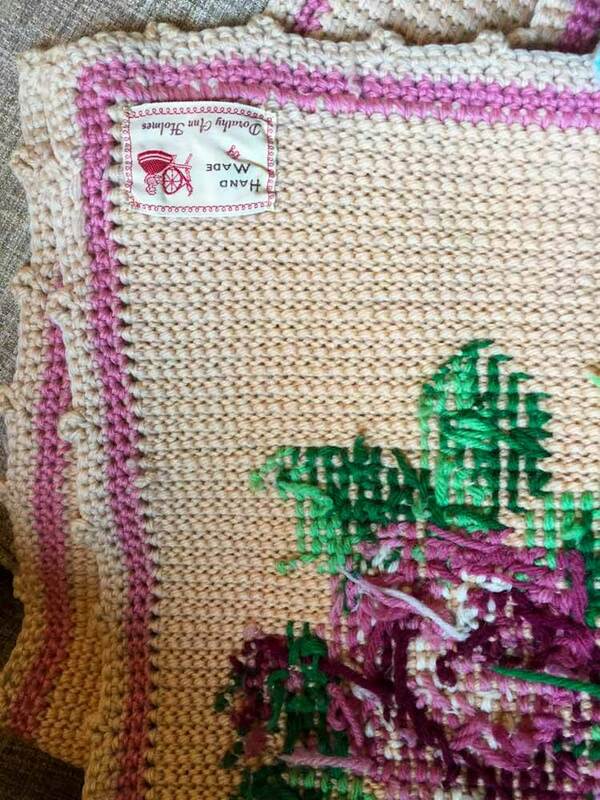 In fact, this could be a great opportunity to put that roll of New Old Stock vintage patterned wallpaper that isn’t quite enough for an entire room to good use. Remember Pam’s friend Clare? Above: Clare cleverly used three strips of vintage metallic wallpaper to accent a dining room buffet — a great use of a very limited amount of vintage wallpaper. 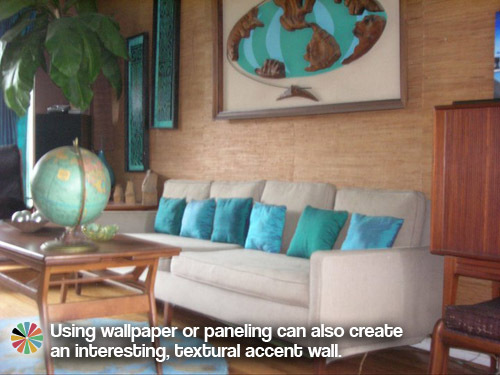 Above- This reader has what looks like textured wallpaper on their accent wall which perfectly compliments their Polynesian retro theme. via 306 photos of reader living rooms. Looking for a more Danish modern approach to the accent wall? Installing some stained plywood or wood paneling might be perfect for you. Feeling a bit more inspired by Frank Lloyd Wright? Natural stone could fit the bill. Channeling your inner Julia Child in your retro kitchen? Try using painted peg board on one wall, which also doubles as a place to hang your copper Jello mold collection. Above: This reader chose their accent wall wisely indeed. The warm orange punches up the otherwise neutral room (complete with plywood wall paneling), and the dark wood beams radiate from the accent wall like the spikes on a starburst mirror. This is a 1955 mid-century modern house in the Lortondale neighborhood (Tulsa, OK). via 306 photos of reader living rooms. Above: An accent wall doesn’t have to be a different color from the rest of your room. 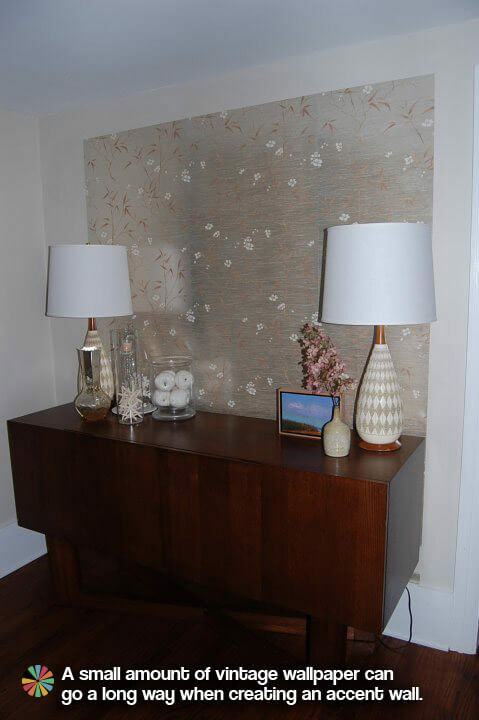 Sometimes creating a texture or raised design on one wall is enough to add an elegant and subtle accent wall to a room like Dave and Kristin did in their lovely Louisville living room. 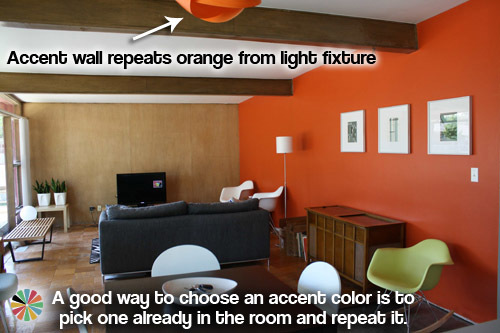 When most people think of accent walls, bright orange or red probably come to mind. If that level of bold scares you, don’t worry! There is more than one way to pick colors for an accent wall. 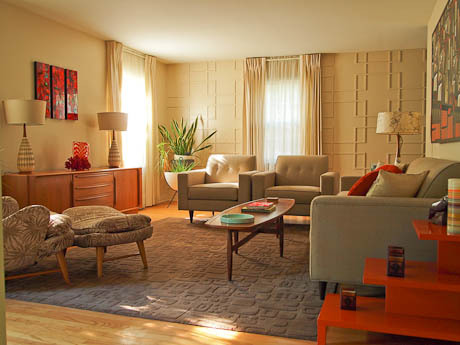 Personally, I like bright, bold colors, (and my favorite color is orange), which is why when I do an accent wall at my retro ranch, it tends to be…well, bright orange. When you are choosing a color for your room, it is important to first decide what color temperature you would like. Do you want your room to be warm, cozy and inviting, or cool, restful and serene? If you aren’t quite sure which way you tend to lean, try looking around your room for inspiration. Repeating an important accent color that you already have in the room in pillows, upholstery, a rug or accessories that you love will not only help you decide your color scheme, but also will help your room look more cohesive through the repetition of color throughout your space. Warm colors like red, orange and yellow advance into your space — they give you an intense blast of color and *may* make the room feel smaller, cozier. Cooler colors such as blue, purple and green tend to recede — they feel more subtle by comparison and *may* make a room seem larger. Whether you choose a warm or cool color, you also can dial the intensity up or down. For example, if you would like a more serene-feeling accent wall, try picking a color that has some grey in it (adding gray to a color is called a shade), or a pastel color (adding white to a color is called a tint). Either of these will tend to feel more restful. 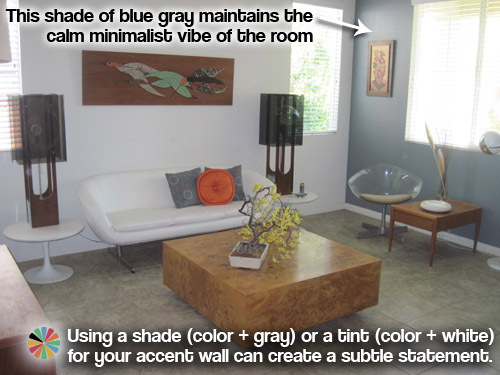 Above: This reader used a blue gray color to create an accent wall that makes a subtle statement in their retro minimalist room. via 306 photos of reader living rooms. If you want to create an accent wall to add intensity to your room, you can choose neon colors. Contrast also can be used to create impact. If the other walls in your room are bright white, and you pick a dark color such as royal blue, your accent wall will be high contrast and therefore have a bigger impact than if you paint your accent wall a similar value to the rest of your walls. For example, painting one wall Mamie Pink when the other walls are soft gray would be high contrast, big impact. No matter which wall you choose to accent, materials you decide to use or the level of impact you decide to make, accent walls can be a great way to add creative design interest to a room without committing to a total room redo. So stop procrastinating! Give it a try! I have a large rustic bedroom 20×20. The walls are paneling. The vaulted ceiling is natural pine boards and the trim is a natural color wood. Red oak hardwood flooring. I want to paint the paneling I’m thinking an off white color, but I don’t know what to do with the trim. Should it stay natural or paint it. I would appreciate any suggestions. I am repainting my bed room. I am concerned which wall to make my accent wall. I intend on putting a small fire place and mount an tv on wall in this room. I see many post that say use the wall that bed is against but I am not sure. I have 2 windows on one side wall and two windows on another wall. Could you give me an idea or what wall to use. The room is very large? I have a NYC apartment with a “home office” which is basically a U shaped room w/o any windows. I want to turn it into a dining room and use the back wall of the U as an accent. Since I have to be able to reverse anything I do, I think paint is the answer. I need to keep it LIGHT – what are your ideas for patterns. I love clean lines and lean towards modern/mid century modern. I have a question….does the accent wall color always have to be the darker color? I am choosing brown and blue and actually thought of doing the blue as the accent wall & brown on the other walls? Everything I have read says it always should be the darker color on the accent wall. Thanks for any responses! I think if the difference in value (light and dark) of your colors is a lot (extreme example: White walls with a black accent wall) it usually looks best if the dark color is used on the accent wall, since the eye will be drawn to it and that is reason #1 for having an accent wall — to create a focal point in the room. If you are going for a more subtle difference and using two colors with values that are very close, it may be fine to use the slightly lighter color for an accent wall, but personally I would stick with using the darker valued color for the accent wall. If you want to make blue your accent color, perhaps just choose a lighter brown (or a darker blue) than you had originally planned. Good luck! I would think that if three walls were one color and one wall was a different color, your eye would immediately be attracted to “what is different.” This would mean to the blue accent wall (even if the adjacent walls were a similar value). Of course, it would be lesser so if the contrast was not as strong. I think it’s all a matter of preference – especially since we all interact with color differently. I am not bold or adventurous with paint. Here is my delema. I have gold colored walls in an open livingroom and kitchen dining area.when you walk in the door, light and medium and cream colored counters is what you see and the fireplace wall which is the wall I would like to accent. Could I paint it lighter like antique white?? Thank you! The problem is the living room is warm and the kitchen is cool. How to decorate the fireplace in a mid century ranch house?